Synopsis: Under the FAA Pathfinder Program, PrecisionHawk’s Phase 2 research indicates technology assist is critical for BVLOS operations. Today at UAS TAAC (Unmanned Aircraft Systems Technical Analysis and Applications Center) held in Santa Fe, New Mexico, PrecisionHawk released the results of its Pathfinder Phase 2 research during an update titled 'Pathfinder Initiative for sUAS BVLOS'. Dr. Allison Ferguson, Director of Airspace Research at PrecisionHawk, sat with representatives from both the FAA, including Robert Pappas of the UAS Integration Office, Gemechu Gelgelu, Manager of Aviation and Rules and Paul Rumberger, FAA Program Manager for CNN, as well as BNSF Railway who was represented by Todd Graetz and Michael Guterres. The Pathfinder program is an FAA-led initiative to facilitate the early introduction of low-altitude operations for small, unmanned aircraft systems (UAS) into the National Airspace System. 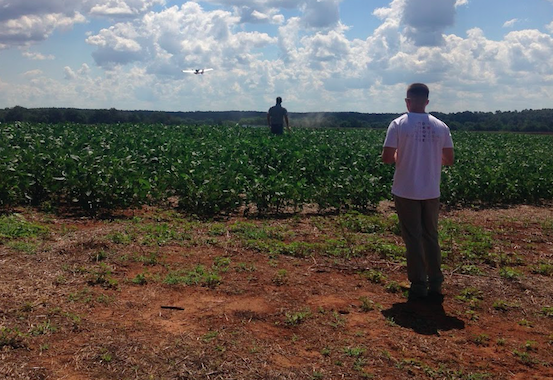 Under the program three companies, PrecisionHawk, CNN and BNSF, were chosen to research advanced drone operations including flights over people and flights beyond visual line of sight. PrecisionHawk's Phase 2 report identifies the operational risk associated with visual detection of an incoming aircraft and the ability to make a safety decision while operating a drone beyond visual line of sight. 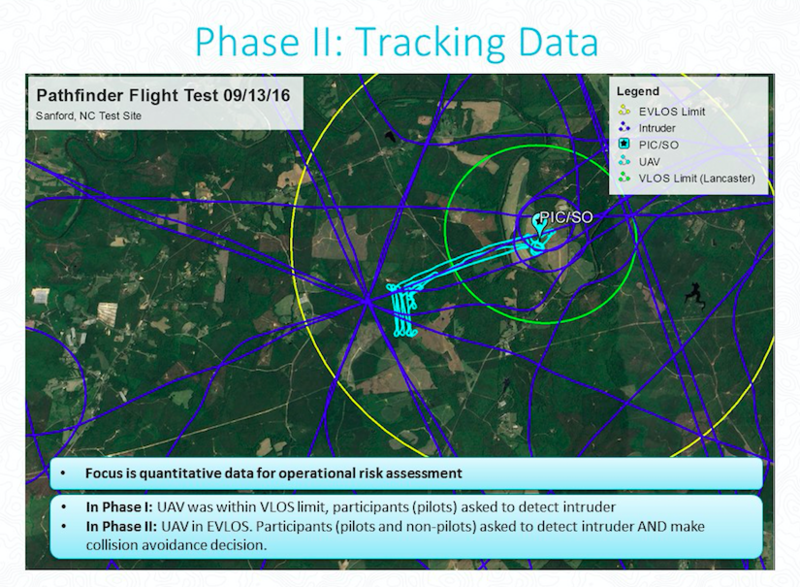 The report concludes that due to human variation, technology assist is critical to make the safety case for BVLOS flight. Phase two testing took place in North Carolina and Kansas with a large sample group of both FAA-certified pilots and non-pilots who were asked to make decisions while flying a drone beyond line of sight. A manned intruder aircraft was introduced into the airspace and participants were asked to both detect the intruder and choose from a series of actions to avoid a potential collision. In this phase of the research, situational awareness of the drone was maintained via the ground control station, and all detection of the manned intruder was done visually. The research measured a wide variety of environmental and human factors that could impact both the detection and decision making process, including (but not limited to) light, weather and visual obstructions, whether the intruder was approaching from a head-on or oblique trajectory, and participant hearing, visual acuity and contrast detection ability. Participants were also asked a series of questions before, during and after the field operation to evaluate qualitative factors such as stress, boredom and fatigue. Analysis of the collected data shows that pilots were generally able to detect an intruding aircraft from further away than a non-pilot (roughly, 2-3 nautical miles for pilots compared to 1-2 nautical miles for non-pilots), although this difference may be primarily related to drone flight experience, as experienced visual observers had similar results. In contrast, the decision making process of both groups, as measured by their reaction times and collision avoidance choices, was nearly the same (reaction time average was approximately 15 seconds for both groups). In the majority of cases, the participants made a choice to lower the aircraft to loiter at its existing location as opposed to returning the drone home to either land or loiter. Choices made by both pilots and non-pilots were in general effective at preventing collision, but in many cases were observed to be unnecessary: had the participants had access to the current trajectory of the manned aircraft, or even simply its actual altitude, allowing the drone to continue on its planned path would have been an acceptable choice. PrecisionHawk’s Pathfinder Phase 1 report, released in August, outlined the boundaries and conditions of Extended Visual Line of Sight (EVLOS) operations for a solo pilot in command. The report quantified EVLOS distance at 2-3 nautical miles for non-technology assisted drone operations. The full report is available here. Phase 3 testing, which will evaluate technologies that can be used to enhance safety, including the LATAS drone safety platform, is set to begin in January. The data from Phase 2 is currently available at https://www.faapathfinderreport.com/, and a full report of PrecisionHawk’s methodologies and findings will also be available for download in coming weeks.